It may be difficult to imagine now, but in the middle of the 20th century, many people left their homes in Britain and travelled to live in Australia, all for the princely sum of ten pounds. These people became known as ten pound poms. Ten Pound Pom is an immigration story in which author Carole Wilkinson shares her own experience of coming to Australia with her family as a twelve-year-old. The focus is on what led her parents to making the decision to migrate, preparing for the move, the journey itself, and first impressions of Australia. 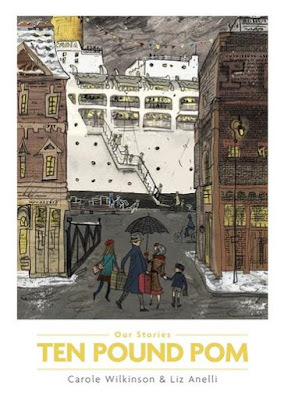 Carole and her family sailed on the SS Arcadia, and at the back of the book you'll find facts about the vessel and the passengers and cargo it moved. There's also an explanation of the ten pound migration scheme, and a glossary. Ten Pound Pom is a non-fiction picture book, told in narrative style. We get a child's eye view of living on board the ship, starting with walking up the gangplank and watching tugboats pull the ship away from the wharf where friends and family wave goodbye. Carole's memory is of a 'huge floating hotel' with swimming, music, movies, and other entertainment. Stops along the way give the passengers the chance to experience places like Naples, Port Said, and Ceylon. And to buy souvenirs and a portable record player and radio. For these ten pound poms, their first stop in Australia is Freemantle, but Carole and her family are headed for Adelaide, where they have relatives they will stay with while they get settled. Life in Australia is different to England. There are animals like drop tail lizards and redback spiders, brand new houses (bungalows, not semi-detached), and big beaches. You also get more pocket money! Carole's written story is complemented by pictures by Liz Anelli, with scenes that depict people and events, and kind of catalogue the experience: a pictorial list of some of the items the family packs to take with them, a map of their cabin, and some of the unique Australian animals. They're both evocative and informative. Ten Pound Pom is one of a series of books called Our Stories, which 'provides digestable chunks of information,' and is a good tool for sharing history and moving or migration experiences, but just as enjoyable to read for pleasure.